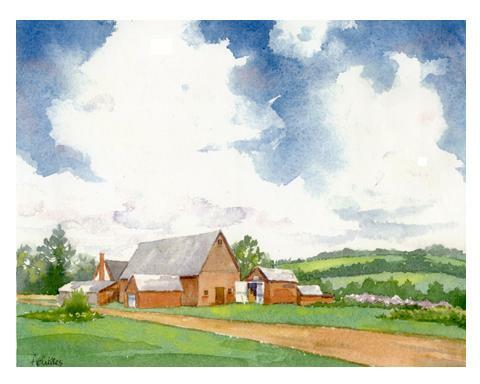 Day 3 of posting a Painting a Day: I painted this watercolor for friends who have a lovely farm in Crapaud, PEI, which we visited years ago. The roads really are red there, just like L.M. Montgomery wrote about in Anne of Green Gables. Years ago I painted this scene of the Roberts Farm in the little town of Crapaud in PEI, Canada. We visited friends in this idyllic spot, the island setting of the wonderful children’s book series Anne of Green Gables, with our children and fell in love with the red clay roads and friendly people, and I remember marveling at the low clouds casting close shadows on the green hills. 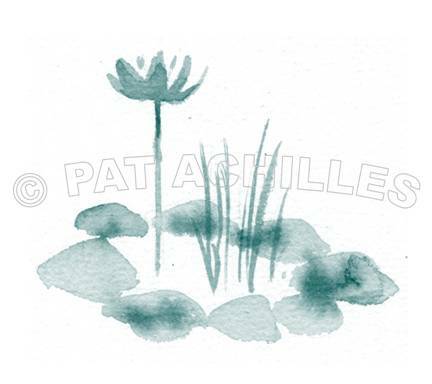 I painted this little study quickly for a client who had a lovely little pond in her backyard. I’ve never been into the ‘zen’ lifestyle, but the client was, very much so, and this little environment she designed was indeed charming and peaceful. I’m usually pretty tightly controlled with my illustration work, so it was nice to experiment with watercolors this way, using some quick strokes and then some slower, rounder organic blobs, letting the color bleed into accidental textures. I’ll make it available as a notecard on my Store soon. Every year a local art supply store has an exhibit of little artworks – only 5″ x 7″ drawings, paintings, illustrations, etc. 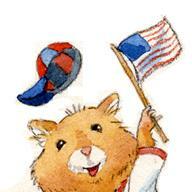 Today I took a pencil sketch I had of a little hamster & started adding clothes to him, and it just got more and more patriotic on me, perhaps because we just had a beautiful 4th of July here in Pennsylvania. For this illustration I used watercolor on illustration board, over the prisma pencil drawing – there is more to him, but I’ll wait to show the whole character after that show happens in a few weeks.